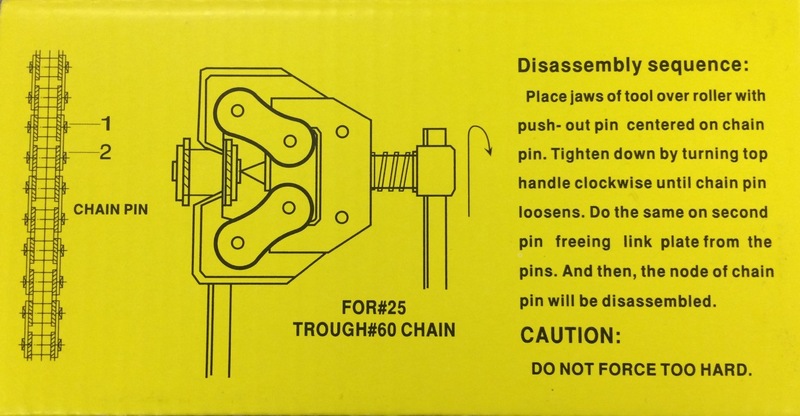 Chain Breaker for sizes #25 to #60 roller chain. 1. Metric #05B to #12B. I had never worked with chains before in my life, but this tool was incredibly easy to use and it did its job as advertised. It lined up perfectly on the pin and with just a few twists of the handle the chain was broken effortlessly and flawlessly. Excellent tool! These are the easiest tool to use when adjusting length on chains. Q: Just making sure , Will this work for a C2050 conveyor chain ? A: Yes, this works on C2050 conveyor chain. Q: I'm using #40 chain, can this tool be used to re-insert a pin after the chain has been opened? A: No, this tool is only to disassemble a chain. Connecting links slip right through the roller link ends, so a tool is not necessary. Q: What chain break tool is right for 05B-1 Meric roller chain? A: Yes, this works with 05B roller chain.